Paul Vazquez, aka the Double Rainbow Guy, has more than an internet meme and a viral video on YouTube. 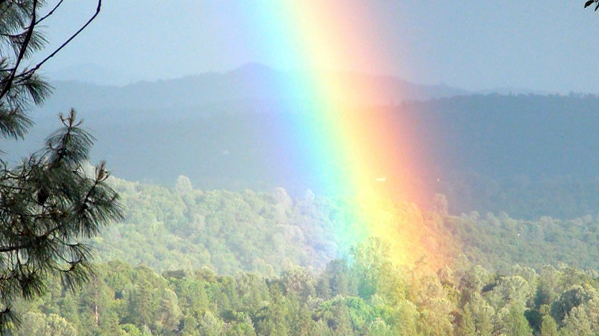 His mountain farm, located in the hills outside of Mariposa, California, is seemingly a magnet for rainbows. Paul says he has a knack for knowing when they’re coming too. You might be wondering why Paul sees so many rainbows. “Since then, rainbows appear wherever I am. I understand how this seems unbelievable, so I do my best to document them whenever I can on photos and video.” These are not isolated to Yosemite either. Paul has been able to document rainbows all over, including one on his visit to Iceland last year. The Law of Attraction assures us that we manifest what is on our hearts and minds. Maybe Paul catches sight of full-spectrum messages in the sky because he’s always looking for them. Perhaps it’s his grateful heart and ecstatic joy that ensure they keep coming around. We have a choice each day about what we will focus on. Are you on guard against chaos? Expecting a fight? Let go of your defenses. When we send out negative thoughts they have a 3-fold effect. They lower our own vibrations, then lower the vibrations of those around us, then are reflected back to us, pulling us down even further. When you have a fearful or negative thought, recognize it. Try not to judge yourself for having the thought. Just let it slip out and replace it with love and gratitude. You’ll soon be seeing figurative rainbows of your own. Tell us: What are you looking for?